Alas, no more! 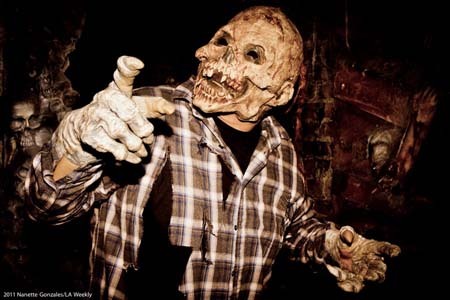 One of the best Halloween events in Los Angeles, thanks to its unique underground setting, Old Town Haunt gave its final performance in 2013. This page is archived for historical reference. OLD TOWN HAUNT 2013 UPDATE: Old Town Haunt is billing this 2013 as its final Halloween, so you owe it to yourself to make the effort this year, especially if you have never gone. OLD TOWN HAUNT KID'S MATINEE: Old Town Haunt no longer offers a lights-on kiddie version of their maze. However, they do present a milder matinee recommended for children ages 7-12; there are some effects, no live monsters, and fewer scares. October 26-27 (Saturday-Sunday) from noon to 2:00pm. General Admission $15 on October 25, 26, 27, 30 & 31; $17 on October 25-27, 30-31. VIP (no waiting): $20 on October 25, 26, 27, 30 & 31; $17 on October 25-27, 30-31; $22 on October 25-27, 30-31. OLD TOWN HAUNT PARKING: There is metered parking on Raymond Avenue. Parking is also available at nearby garages. Rates from 5:00am to 10:00pm are free for 90 minutes or less, $2 thereafter, $6 daly maximum; from 10:00pm to 5:00am there is a flat rate of $5. Marriott Parking Facility 171 N. Raymond Avenue. OLD TOWN HAUNT LEGEND: Located in the heart of Old Town Pasadena, this haunt (which bills itself as "Pasadena's biggest and scariest") is situated in a venerable building that (according to the website) is a bank that was robbed decades ago: the robbers tried to escape through catacombs underground but were found horribly managled by some unknown agency. Since then the catacombs have been closed, but now they are re-opened for you to explore. 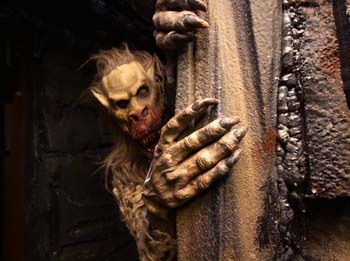 OLD TOWN HAUNT FEATURES: Old Town Haunt has a distinctive, subterranean setting that makes it unique among Halloween attraction in Los Angeles. You enter by walking down darkened stairs into dismal catacombs illuminated only by faint, flickering light. The sets and props are impressively elaborate and convincing as you explore the labyrinth of tunnels (including a tiny crawlspace). 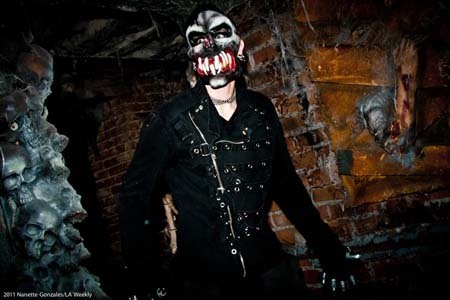 Haunted by numerous ghoulish ghosts and angry apparitions, the underground haunt is more than extensive enough to give you your money's worth. RELATED HAUNTS: Before his untimely death, Old Town Haunt was co-owned by Bob Koritzke, who also owned or co-owned Spooky House , Seaside Haunt, Fearplex, and Skull Kingdom. OLD TOWN HAUNT VIDEO: View our video tours of Old Town Haunt. 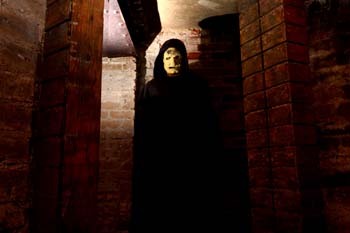 The 2006 vid features a descent into the catacombs. 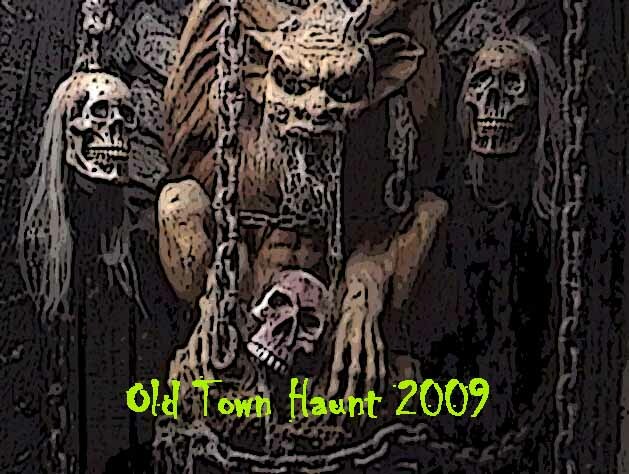 Check out our archive of Old Town Haunt articles.